We have an OCEANFRONT studio located right on a beautiful, sandy beach. Our condominium is on the fifth floor of a seven-story building. It has a lovely view of the island of Lanai, turquoise waters, and our wonderful whales (in winter). It is located on the leeward side (sunset) of Maui. It is a 22-mile, 45-minute drive from the Kahului Airport. If you are coming to Maui from another island, the West Maui Airport, a limited service airport can be used. This airport is only eight miles from the Lahaina Shores condominium. If you wish to see all the sights of Maui, all standard car rental companies are represented at or near the airports. If you prefer not to rent a car, there are two shuttle services on call. Next door to the condominium is a charming, little, shopping center with restaurants, shops, and a convenience store. One of the finest Hawaiian shows is located right on the beach a few feet away. You are a short walk to the Lahaina Boat Harbor where you can partake in all the water sports, deep-sea fishing, submarine rides, etc. The historic town of Lahaina offers a magic all her own, bordered on one side by the ocean and the other side by majestic mountains. There are many wonderful places to eat and to do all the shopping you have in mind to do, plus more. Maui is the golf center of Hawaii with over 15 championship courses. There are two just five minutes away, at Kaanapali. Within walking distance, we have a triple movie theater, many art galleries, and, of course, many T-shirt shops. Bicycles, surf boards, and snorkeling gear can all be rented in Lahaina. Wifi in room with both high speed wireless and cable TV. Wall mounted 46 inch flat screen. Some in the lobby cabinet. Many courses within easy drive. Lahaina Shores is a wonderful property. The staff is always friendly, and the facility is a great location. The unit we stayed in was clean and very comfortable. We have used this unit in the past and would use it again. A charming if well used condo. Our stay was 35 days. An ideal location and views however disappointed with accommodation. We love Lahaina Shores and have stayed 5 to 6 weeks for the past 8 years. This Unit was a real disappointment in its furnishings especially with the Murphy bed with little or no support. There was a real lack of drawer space for long term stay as most storage was on open shelving. Our first day was consumed with scrubbing black mold and mildew from the shower. The fridge shows significant rust around edges and seals. The fridge was full of open food containers from previous tenants. A scheduled shut down of air conditioning was not disclosed to us. No compensation was offered when this was brought to owners attention. While this unit has a beautiful view, I cannot recommend it for any more than a weekend stay. 1. The Murphy Bed: I have had no complaints . It is a double spring two mattress bed that you expect in a Marriott/Hilton hotel. It folds up to make this bedroom into a family room. 2. Drawer space: Lots of shelves with one five drawer chest. My wife and I stay here for many weeks without a space problem I’ve had no complaints in this area. 3. Bathroom shower. There is a walk in shower. I haven’t had complaints in this area but will inspect this next week. My wife and I will be staying here for the next four weeks. 4. Rusty refrigerator. Hawaii humid air is not kind to houses/condos. especially those accommodations close the beach. While there in the next few weeks I will correct this if I find a problem. 5. I will alert my cleaning lady of these problems. 6. Building AC shut down: The glass door to the beach is 6ft x 8ft when open it allows fresh air to the room immediately. A feature of this condo like no other in Hawaii. The sound of the surf will put you to sleep. This guest had health problems “asthma” I believe. He was not out to enjoy the fresh air of Maui’s beachfront. He told me he needed an air conditioned room 24/7. I did not know this until his contact during the 3 day AC outage. At this point he wanted a refund which I did not accommodate since he had been there for 3 weeks. This generated this review above. Perfect for us, we enjoy breakfasts & snacks on the deck! We enjoyed our stay here. 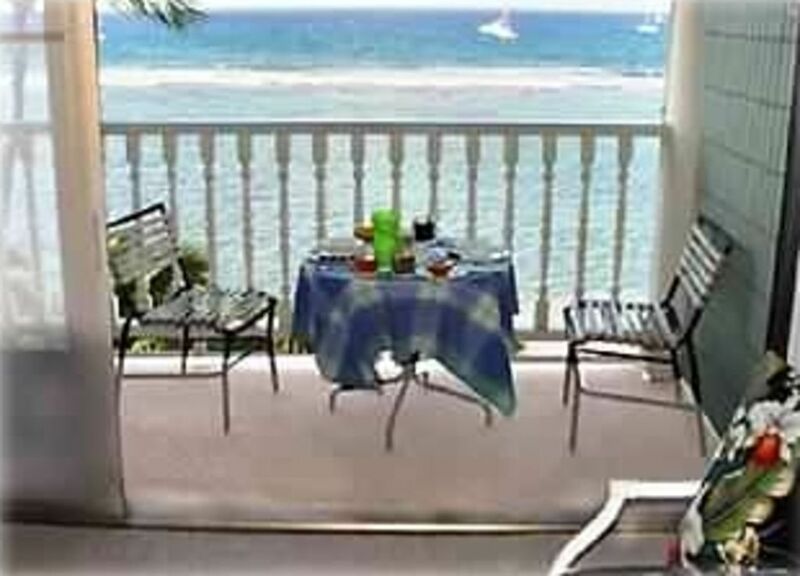 It is on the edge of Lahaina and very convenient. The ocean view is tremendous. Everything works fine! We would go back here again. There are a few (3) things that need minor cosmetic maintenance which would move it to 5 star. Perfect condo with awesome beachfront view! Condo was very clean and well kept. All staff was helpful and friendly. Had everything we needed and more! (CHAIRS to take to the beach, boogie boards, extra beach towels, you name it they had it!) Great location, within walking distance of everything in Lahaina on Front Street! View is unbelievable!!!! Will definitely be staying here again on our next visit! Highly reccomended!